Tony Klar didn't start school with the intention of studying social work, but when a personal tragedy struck, his life goals shifted. The 53-year-old retired from the Army and the Army Reserve in 2010 with 24 years of service and tours of duty in Iraq and Kosovo, and was working for a beverage distributor. He decided to use the G.I. Bill to pursue a bachelor's degree in management and organizational behavior at St. Scholastica. After returning home from his first class of the 2012 fall semester, Klar said goodnight to his 28-year-old son, Joe, who was headed out and promised to be right back. "A half an hour later, I had the cops knocking on my door," Klar said. "He had crashed into some pine trees on Highway 61 and was dead on the scene." He blamed himself in the death of his son, who had struggled with substance abuse. "I have tremendous guilt just because I think I could've done better," Klar said. He decided to pay tribute to Joe's memory by going into social work to help make a difference in others' lives. Fueled by the belief that having information about substance abuse and mental illness might have helped him in dealing with his son, he now hopes to use that knowledge to benefit others in his son's situation. After completing his bachelor's degree in 2013, he enrolled in St. Scholastica's first-ever Master of Social Work cohort. "Unfortunately I can't go back in time," he said, "but what I can do is hopefully help others going forward." 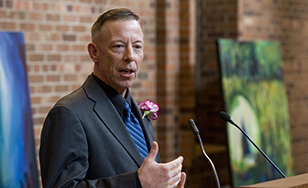 "Tony came to our MSW program with a sincere desire for personal and professional growth," said Connie Gunderson, an associate professor in the social work department. "To witness his growth has been an honor." He's looking forward to putting what he's learned into practice. "It's going to give me an opportunity to actually make a difference," he said. "The Benedictine Values - that's life. If we can do half of them right, we're in good shape."